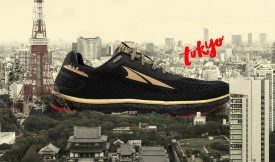 (Logan, UT – January 29, 2019) Altra released the Tokyo edition of its popular Escalante Racer inspired by Japan’s capital city. This limited edition shoe highlights a gold skyline silhouette on the outer heel collar and golden midsole racing stripe with a jet black upper. On the shoe’s inner side, Japanese brushstroke lettering pairs “Tokyo” with a large “19” to highlight the year. This racer is available for men and women in the same black, gold and red color scheme. Tokyo is the first city in Altra’s line of global Escalante Racers with Paris and London-inspired shoes set to release in 2019, followed by Boston and other cities with iconic road races. The Altra Escalante Racer has a fitted, breathable engineered knit upper, making it ideal for racing tight corners and quicker movements on the course. Altra’s EGO™ midsole has been “race-tuned” to deliver more energy return for a more responsive ride. Altra added its Foot Pod™ technology to the racer, which allows natural flexibility on the shoe by mapping the bones and tendons of your foot. With a 22mm stack height, weighing just 6.8 ounces for men and 5.7 ounces for women, this shoe is ideal for 5ks to marathons and everyday use. The Escalante Racer – Tokyo is available for $140 on www.AltraRunning.com or at your local specialty running retailer.